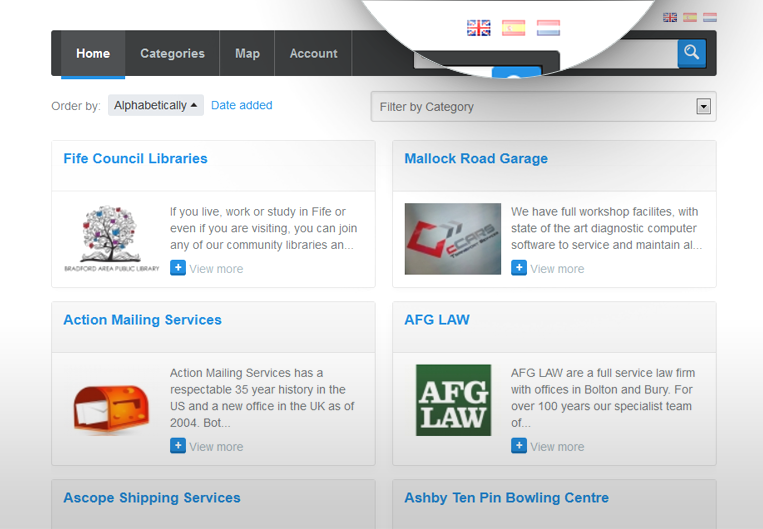 Use the Yellow Pages Script to create and maintain your local business directory. Once installed, no coding skills are required to run your business listings. Check all default features of our PHP directory script below! Need some modifications to the business directory script? Just contact our Support Team and describe the necessary changes! 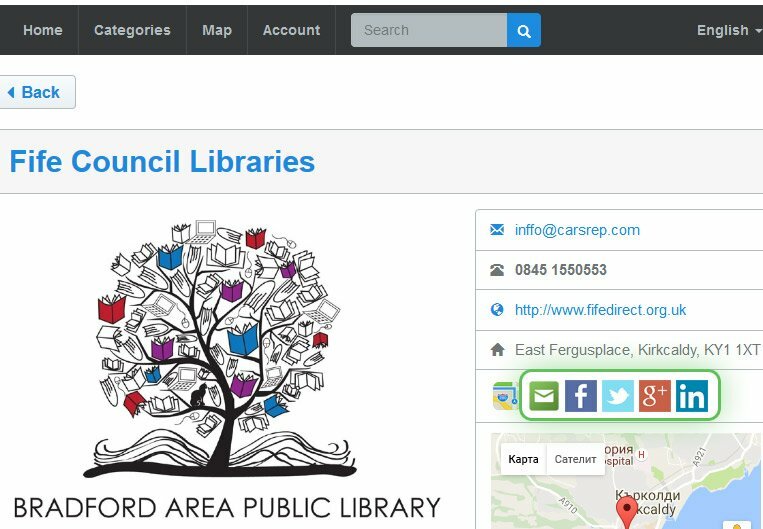 This business directory script allows anyone to maintain a yellow pages-like website. You can add an unlimited number of business listings, manage categories, user registrations and third party listings easy as a piece of cake. 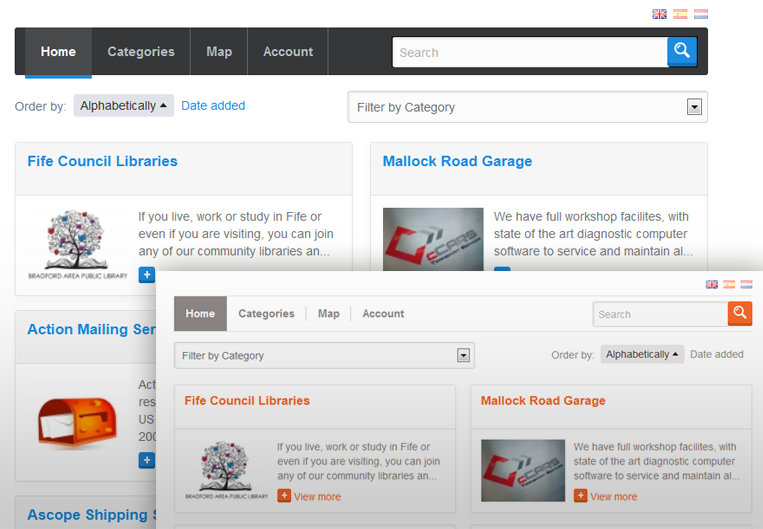 Using an intuitive administration page, you can configure various settings without any technical knowledge. Customize the yellow pages front-end, add languages, edit auto responders, and manage many other features. Monetize your online business directory by allowing business owners to list their profiles. Set prices or make the service free. 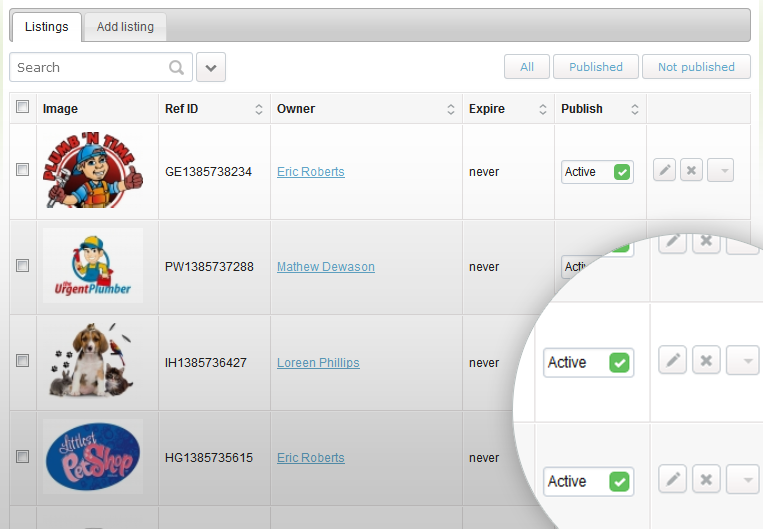 Turning on the third-party submissions automatically enables owner profiles and registrations. PayPal gateway is integrated by default with our directory listing script to automate the process of adding and publishing business listings by users. 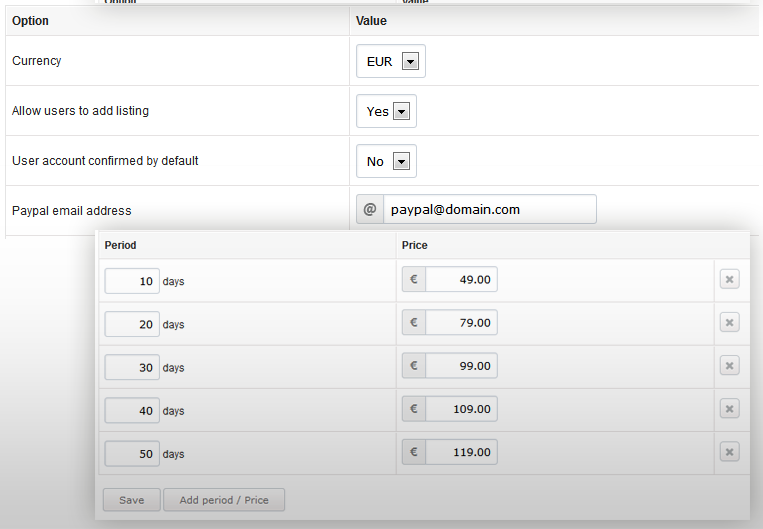 To enable online payments, just add your PayPal account into the business directory script. Need another payment gateway? We can add it for you! All company addresses listed on your site will be displayed on Google Maps. 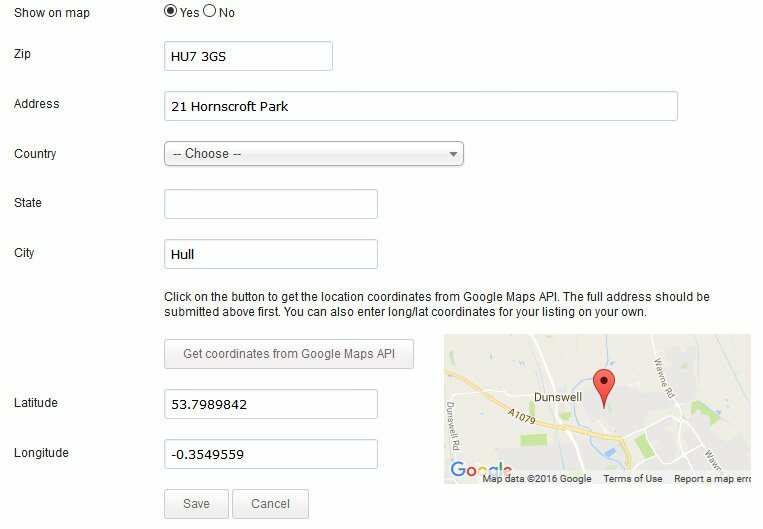 Just enter the street coordinates (latitude and longitude) or ZIP code and the business directory script will locate and pin it on the map. 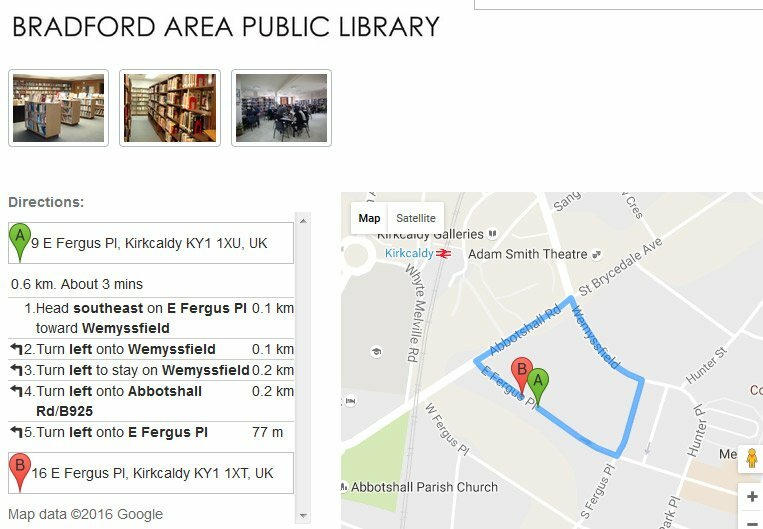 Website visitors can retrieve Google Maps driving / walking directions to a certain business address by entering their current location. They can print out the suggested route or use their smartphones for easier navigation. 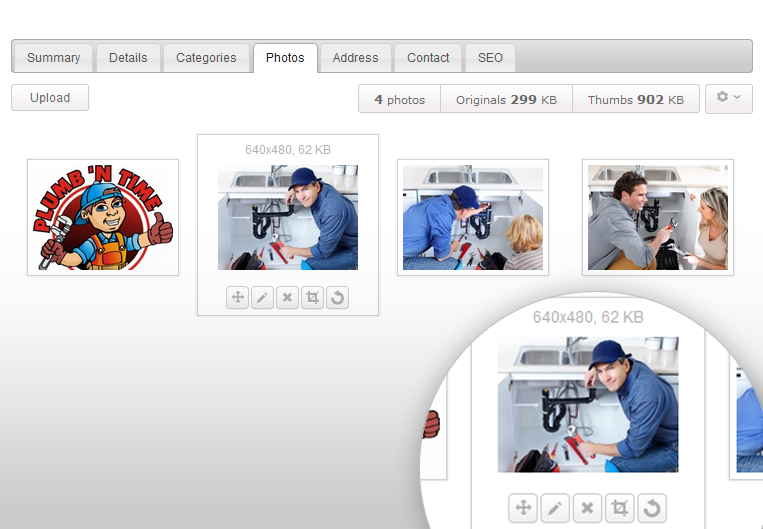 Quick email and social share buttons are integrated by default on the Yellow Pages front-end interface. Your website visitors can send business listings to a friend or post them on Facebook, Twitter, Google+, LinkedIn, etc. Optimizing your business directory for search engines is crucial for your online success. 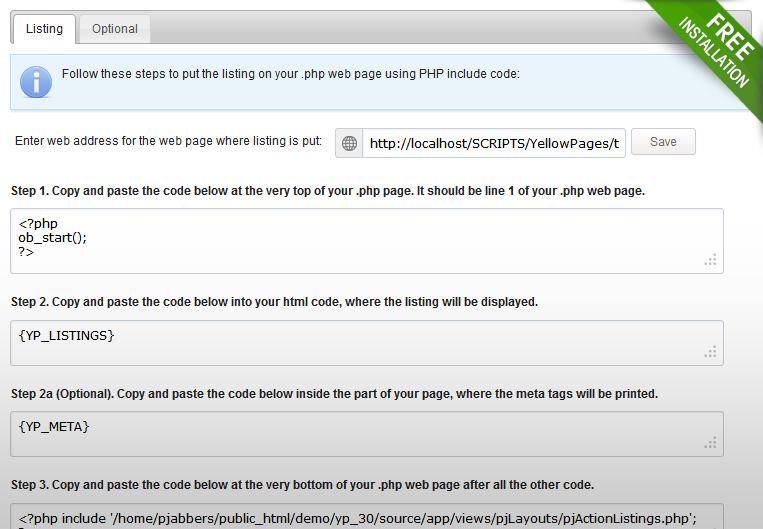 That is why we have added a meta tag editor and SEO-friendly URLs to our PHP directory script. 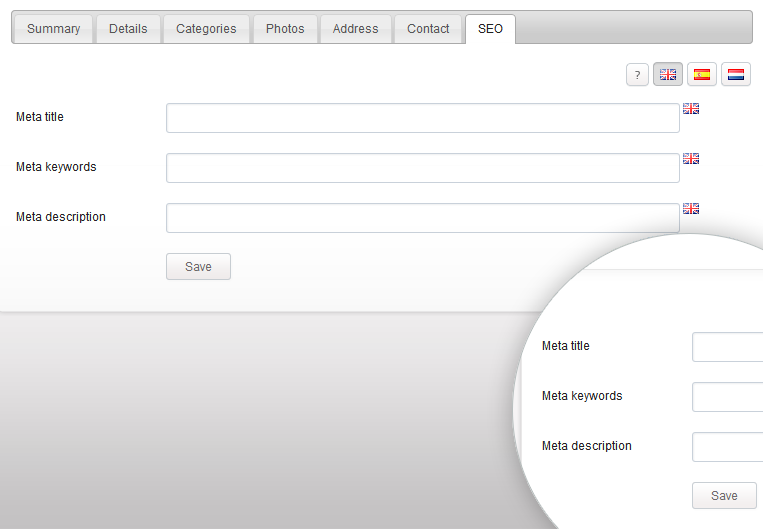 Add custom meta tags for each page when you add or edit listings and follow the instructions in the admin. Ten different color themes are available by default. The business directory script can be customized using the external CSS file. 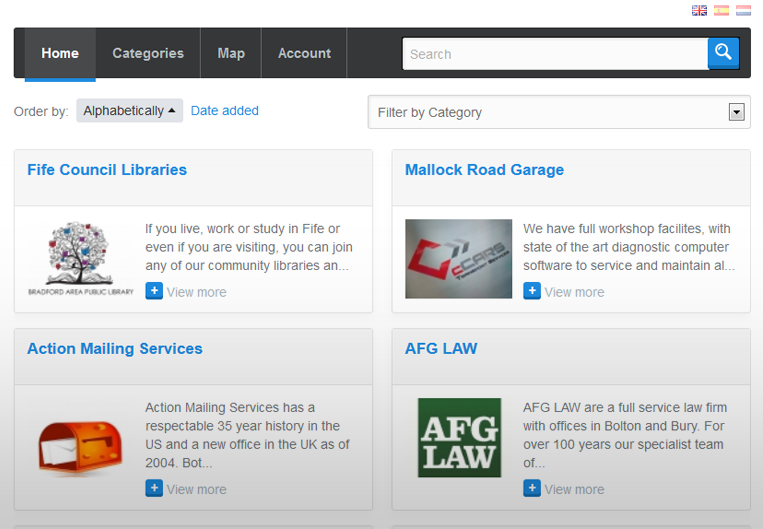 You can change the business listing pages so that they blend with your existing website. The Yellow Pages Script allows you to crop and resize images, add watermark or compress pictures directly from the PHP directory listing script. Just drag and drop images to add a new one. System messages for new user accounts and password recovery are available for editing from user with administrator level of access. 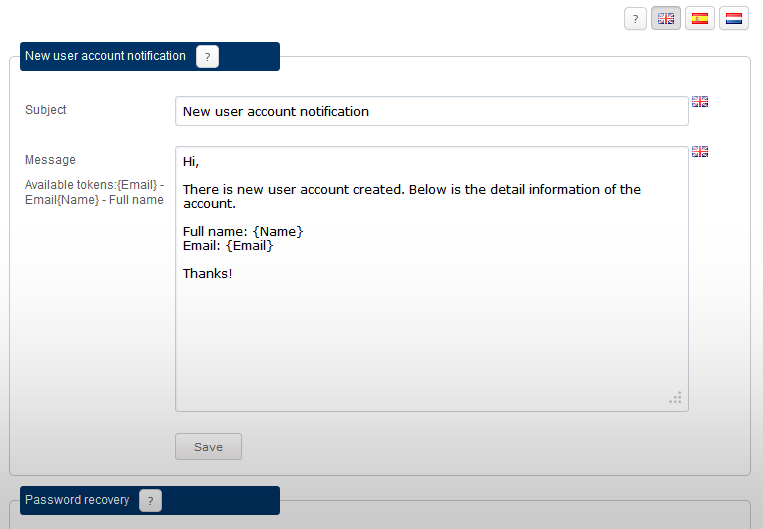 Use the available tokens to customize and personalize your email messages. You can easily translate the PHP directory script into any language and also add multiple languages on the front-end, so your visitors are able to switch the front-end language by clicking the corresponding flag. Prevent any loss of information by regularly performing a backup of your database and files. 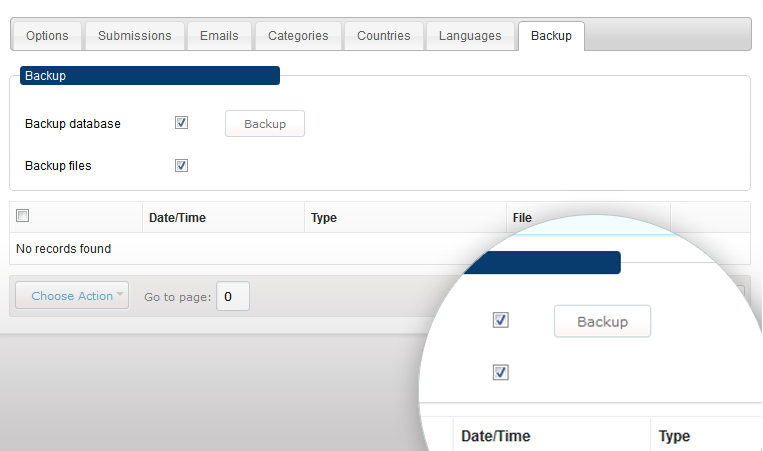 Log in as an administrator to the script admin and perform the backup with just one click of a button. Using the One admiN feature, you can set up a single login screen for multiple PHPJabbers scripts. 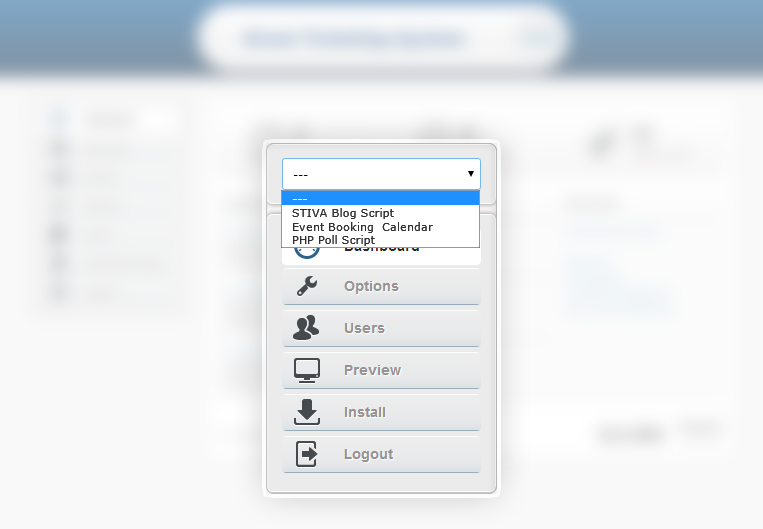 Once enabled, you can switch between script admins from a simple dropdown menu. An installation wizard will automatically install the Yellow Pages Script for you. Just upload the files onto your hosting account and the wizard will start. 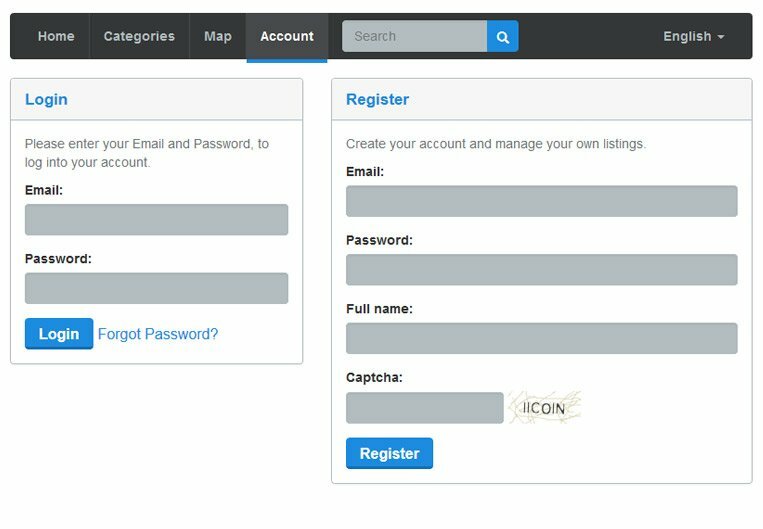 Check out our knowledge base to see how easy the setup process is or request a FREE installation! The PHPJabbers framework is specially developed for high-rate performance. It can handle even heavy databases. Watch a video demo of one of our scripts having 1 million listings added and 8 million records in the database! Web developers would most probably want to modify the Yellow Pages Script by themselves. With a Developer Licence, you receive access to the business listing script source code and a guide for our framework. We can also deliver all kinds of custom modifications upon request! Yellow Pages Script comes with the following special features: Installation Wizard, High Performance PHP Framework Protected Against SQL Injections, One admiN Module, Translation Module & Backup Tool, User Permissions & Encrypted Passwords, Clean PHP Code & Developer Licence. You may also benefit from our extra services: FREE Installation & Support, Free Updates, Remote Hosting, Payment Gateways Integration, Web SMS, Custom Modifications, Extended Licence Program.